For YouTube video fans who use iPhone to view YouTube videos online, they are extremely familiar with YouTube iOS app that is an excellent application to watch YouTube online videos when there is data connection.However, there are many accasions where those people will be stranded by lack of Wi-Fi or mobile data.For those iPhone users, they can perfectly solve the problem by downloading YouTube videos to iPhone. In the post, I will introduce a method on how to download YouTube videos to iPhone. To download YouTube videos to iPhone, there are several major processes to reach the aim. First of all, we need to download and install YouTube video downloader for iPhone.Then, we can start downloading videos from YouTube. Sometimes, the format of video downloaded might be incompatible with our iPhone devices, and here we need a converter to convert downloaded video into other video formats that is compatible with our iPhone devices. A third-party app to download YouTube videos iPhone is required to download YouTube videos to iPhone. There are many YouTube video downloader programs such as YTD Video Downloader, Any Video Converter, Clip Converter, etc. However, none of them is easy to operate compared with Leawo YouTube Downloader.Leawo YouTube Downloader comes into play when downloading videos from YouTube to iPhone including the latest product of Apple Inc iPhone 6s Plus. 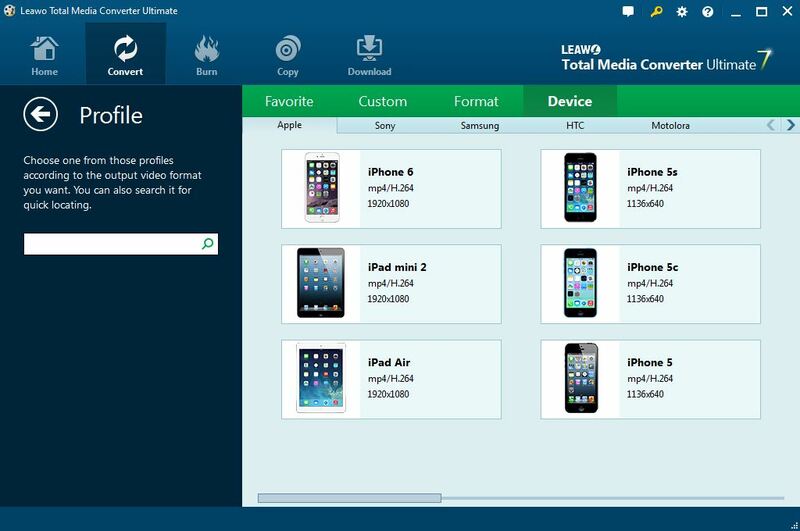 Integrated into the media software combo together with video converter, Leawo YouTube Downloader is built under “Download” module of the upper menu of the combo Leawo Total Media Converter Ultimate while video converter under “Convert” module. We choose Leawo YouTude Downloader to download videos from YouTube to iPhone as it features the following functions. On the waiting-to-download list, there would appear several video files in different resolutions, formats and codecs. You can choose the appropriate ones to download to match your iPhone devices. Lauch Leawo YouTube Downloader and then we begin our step-by-step guide on how to download YouTude videos to iPhone. In the following tutorial guide, we take Leawo YouTube Downloader (Windows version) as an example(the tutorial guide of Leawo YouTube Downloader for Mac is relative the same as that of Windows version). 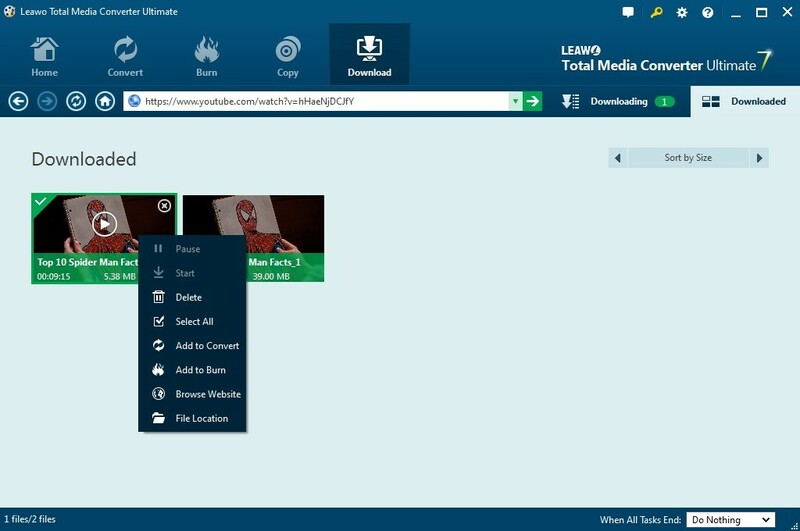 Click the green triangle on the right side of the main interface to call out a waiting-to-download list, where videos in different sizes, resolutions, formats and codecs are available for choosing to download. You can choose one that best suits your iPhone device. When the downloading is completed, you can find the downloaded videos on the “Downloaded” tab, where you can perform after-downloading operation, such as converting downloaded video into other formats compatible with your portable devices, or burning downloaded video to DVD or Blu-ray. All you have to do is right click the downloaded video, and choose “Add to Convert” or “Add to Burn”. If you are not satisfied with the quality or format of downloaded video, you are allowed to convert it into your desired format that perfectly match your iPhone device. Just follow the steps below to complete conversion process. On the pop-up profile panel, you can choose “Device” column to single out your iPhone device. If your device is iPhone 6, click “Device>>Apple>>iPhone 6″ to confirm the selection. You are only a few steps away to download videos from YouTube to iPhone. 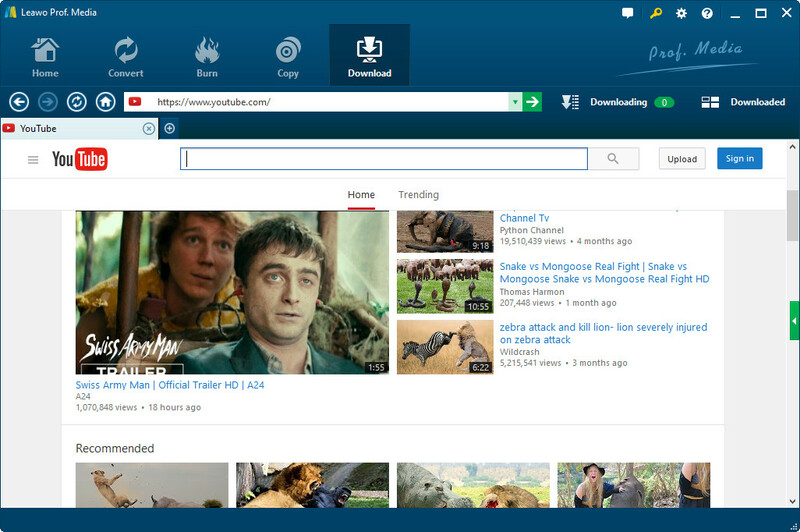 Free download and intall Leawo Youtude Downloader to have a try!